87% of households in the area where we work are food insecure – they do not have access to nutritious food regularly. ASAP responds to the immediate needs of the orphaned and vulnerable children by providing a nutritious meal daily so they can learn with a full tummy and take anti-retro viral medicine if needed. Concurrently, the local community learn sustainable organic farming practices to reduce vulnerability and improve resilience in the face of rising staple food costs so that the children, their guardians and caregivers have access to nutritious food consistently. We provide access to clinics so children can receive the medication and care they need. In South Africa children may not attend school without a uniform. We provide each child with a full school uniform so they can access education with dignity. ASAP provides counselling for the children who are traumatised by the loss of their parents, or in need of emotional care and support. Our in-house counselor helps children process their emotions through play therapy or positive coping mechanisms for older children. Lay counselling skills are essential for caregivers. We help children access legal documents and government services such as government grants. Children sleep on cold hard floors in non-insulated huts in inclement weather. Their immunity can thus be lowered and make them more vulnerable to opportunistic infectious diseases. We provide the basic comfort of a mattress and blanket to guard against the cold in Winter. We want to give children back their childhood. We want them to play. We provide, when possible, jungle gyms and large outdoor play equipment so children can play and develop gross motor skills. The after school care programme sees them tackle projects which develop fine motor skills, both essential to healthy development. The after school programme’s aim is two-fold: to give the children a safe place to be after school, and to offer support for their education with caregivers and teenagers working with their peers and younger children on their homework. The Alfred Nzo District is located in one of the most poverty stricken provinces of South Africa, where unemployment is estimated to be as high as 38%. In order for local communities to provide sustainable care for the children in their villages, they need networks, resources, skills and action. ASAP facilitates workshops to help communities identify their vision, mission and goals and what plans and steps to take to meet their objectives. This includes providing resource mobilisation training and access to broader (donor) support networks. We respond to community identified skills deficits and provide in-house training or accredited partner service providers so CBOs can establish the fundamentals they need as a base to grow their organisation to reach more children. Accredited training enable individuals to charge for their services and expertise and access greater earnings over time as they provide essential services within their communities and through job placement. This benefits not only their own family but the broader community. 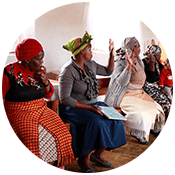 Micro savings training has a powerful and long lasting effect and uplifts an entire community. Organic food production and micro farming enterprises addresses food insecurity not only for the children in need but the entire village. ASAP provides on-going training and purchases vegetables for the children whilst assisting in setting up access to market for the new and established organic farmers. This intervention helps to break the cycle of poverty and increase earnings for participants. 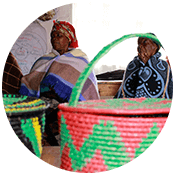 ASAP provides training in income generation enterprises to aid communities to earn steadily along with other resource mobilisation efforts to sustain their holistic OVC care services. Sewing, baking, farming and cooking are all services which carers provide to the community, further entrenching their value. We help identify and set up links to market with on-going business development support. Lay counselling and play for communication are core training ASAP imparts so caregivers can provide quality child care. Guardians are mentored and learn these skills from the caregivers. ASAP partners with groups of women already providing care to OVC. Over time, many formalise and form organisations capable of sustaining and scaling broad based care to reach greater numbers of children. Organisational development skills training enables groups to develop and manage effective legal entities. In a region considered the most text poor in the country, ASAP provides cupboard libraries in Sotho, Xhosa and English at local schools and community care centres. We train caregivers and local teachers how to manage this precious resource so children and adults alike can develop their ability to read and improve literacy levels in the region. We work with local communities to identify assets both tangible and intangible. ASAP facilitates processes in which stakeholders identify priority areas to improve upon and strengthen. Every child needs a safe place where they can receive love and care and eventually thrive. Community care centres are the base where caregivers provide quality broad based child care. A village mapping process identifies safe areas for children where, if possible, a community care centre can be erected and which then becomes the base from which to work. ASAP holds regular HIV awareness and testing days.